awesome, awesome, awesome..love the sporty look with the neon..you killed it! amazing pictures!!!! I love how you put everything together!!!! LOVEEEEEEE EVERYTHING IN THIS POST!!!!!!!! The dress is great and the NEON details??? TO DIE FOR!!!!! a beauty(YOU) in a great SPORT-CHIC style!!!! You are totally the BEST!!!!! To be honest I really don’t like that bag, if you want something practical I prefer a normal cross-body bag. But your dress is really pretty ! love it dear. everything with neon is so amazing. the dress is really special. like it! you have styled it perfect!! Love this sportswear look! Not quite sure how, but you just convinced me the next thing I need to buy is a fanny pack. Great look! I really love the neon! You look soooo amazing! Love the neon detail! Beautiful dress!Looks great on you! You look amazing and great in neon! fabulous cardigan! i love the neon! That’s really a great combination, I love it! The neon that pops out is really a great touch to it! This dress looks so great on you. Love your outfit. You rock the neon details! Love the neon details & your shades !! Awesome neon! The bottle holder…er..hand holder, i suppose its for both? either way it looks cool! The way you open the inner lining is so powerful! Haaha. Now if only you would walk like that and not get strange looks. Awesome colors. I love it! sporty chic and I have to say that you add class to this outfit. classy-sporty-chic! YOWZA! I absolutely love this outfit on you Veronica ^_^ THe neon and grey is killer. <3 that trend oh so very much now. You ABSOLUTELY killed it! Wouwwww amazing look, your Puma Jacket is amazinggg!! Love it! love it !! you’re amazing and you outfit is simply stunning !!! Great neon color! So trendy! I love it colors Fluor! 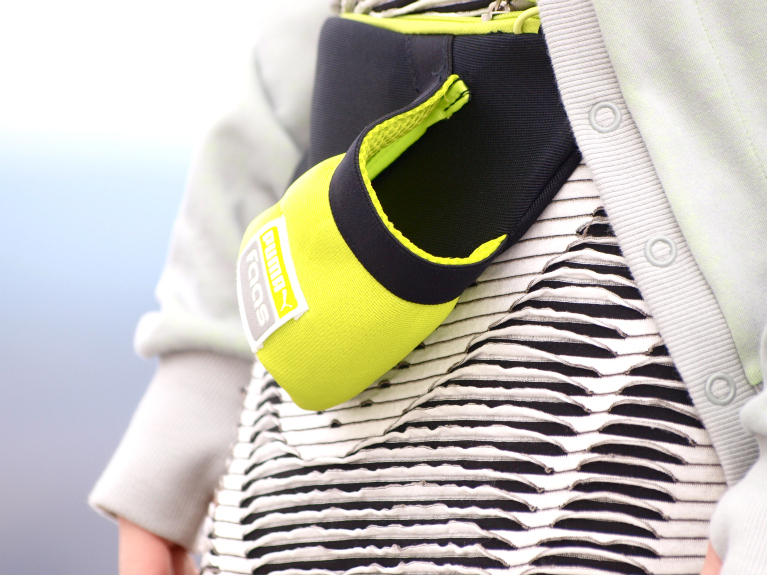 I can’t remember the last time a waist pack look so good! Fantastic combo V.
Love the cardigan! And your sunnies are amazing!! Yowsers, what a fab pop of neon there! Looking stunning V! This color combination is incredible and you look amazing! Urban perfection!! Loving neon touches!! Love your take on sport- chic! Yellow always looks great on you, btw! oh, perfect look. I love neon! this is amazing!! loving neon details! I’m a big fan of adding sporty elements in and this is literally perfection! I love the neon jolts against the black and white pattern, stunning styling as always love! PS: Be sure to enter my giveaway!! thanks for your visit…I follow you ! Absolutely love the dress! Love how you wore it with neon color. You’re so stylish. Muy buenas fotos..y como modelo guapisima..me encanta la peca en el cuello..un beso desde Murcia..seguimos..
yes, you look so chic! great combination as always! love the neon!! look fab as always!! Wow! Beautiful splash of neon in the grey winter world! Cool sporty outfit, you look great! hallo dear! amaaaaaazing blog! i love all your styles so much! what to say about this outfit! looooove! iam following you!!!!!! visit my blog and follow if you like! thank you!!!!! amazing!! you are so stylish!! amazing!!! I’m so loving your blog!!! TRES CHIC!!! Obsessed with your dress and sunnies!